Sat Physics subject questions on electric fields and forces with detailed solutions, similar to the questions in the SAT test are presented. Answers at the bottom of the page. If vector F is the force between two charges q1 and q2, then what is the force between the charges 2q1 and -3q2 located at the same position as q1 and q2 respectively? 36 J is used to move a 3 coulombs through a potential difference of V. What is V? Fig1. - Electric Field On Perpendicular Bisector. What is the direction of the electric field at point M due to the charges q and -2q at point A and B such that M is a point on the perpendicular bisector of AB and charge q is negative? 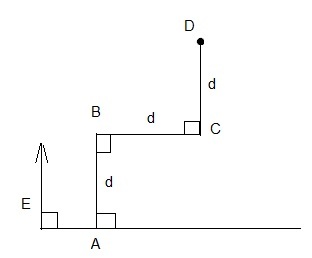 Fig3. - Work by Electric Field. 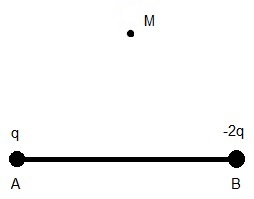 What is the work done by the electric field E (assumed constant and present everywhere) to move charge q, starting from point A, along path ABCD as shown in figure 3? Which of the following is correct about a closed electric circuit including a battery and a resistor? A) charges move through the circuit because the resistor supplies energy. B) charges move through the circuit because the battery maintains an electric potential difference across the ends of the external circuit. C) charges move because they are supplied by the battery. D) charges move through the circuit because they can acquire kinetic energy from the resistor. The electric field at a distance r from a charge Q is equal to E. What is the electric field at a distance 2 r from a charge 2 Q?